An early jumbo took us from from the airfield to the bus station. The road to Vang Vieng was steep and windy but the full volume Thai power ballads entertained. We arrived early, suddenly and a tuk tuk whisked us off on the hot dusty roadside to Phoom Chai Guest House (GH). A Canadian, Tanya, the only other westerner on the bus joined us. Another GH strategy – get in a tuk tuk and go where they recommend. This one paid off – big almost new semi detached bamboo bungalows for less than a fiver with a gentle, friendly elderly man to greet you. We settled in – I am somewhat ashamed to admit after Phonsavan it was a pleasure to be back on the beaten track with a veranda and sociability. Wandering around we began to be aware of the strangeness of the town that is Vang Vieng. 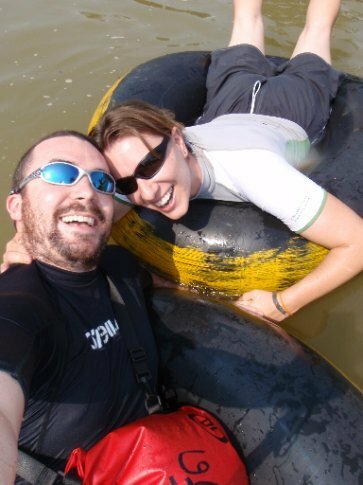 It has risen to fame due to tubing – drifting along the river in a tractor inner tube. It's a small town apart from that – a few criss cross streets, packed with places with comfy cushions and pillows for TV lounging. The slightly disturbing thing was that they all show episodes of Friends, all day, every day. One maverick showed Family Guy – but that place was always empty. Tanya joined us for cards which turned into a bottle of rum and then a curry. Wrong order. It rained heavily all night and into the morning – mercifully causing us to postpone plans for tubing. Instead we took our hangovers up town to “Friends”. The theme tune actually causes a type of Tinnitus after excessive exposure. It seemed only right and proper to have to spend some time with friends before tubing. We crammed into a tuk tuk with a United Nations crowd, tubes strapped over the roof, puncture repairs in most.. A packed open air bar beside the river with thumping tunes greeted us. It was a bit like like how I imagine an 18-25 holiday in Cyprus. Most revellers bore “In the Tubing” or Beer Lao singlets and were adorned with skin graffiti, some with esoteric comments, others with their chosen bar or scribbles. as decoration, or perhaps more of a tribal marking. Curiously 85% were scantily clad English people under 20. We felt a little out of time in our sensible SPF50 rash guards. There was an enormous zip line at the first bar with a ludicrously small landing area in the dry season. I had no desire to do it. After a beer we got to it, jumping into our tubes and floating down the river. We didn't make it very far. We were pulled into the next bar with the promise of free buckets later at a bar in town. So the afternoon continued – we stopped at the first 4 bars, meeting a motley crew of people, the quieter bars, further down the river seemed to appeal more – less music and more conversation. Or maybe the drinks were kicking in. In fact that's definitely what it was – the drinks kicking in. One of the bars had a big water slide which looked like fun and a bit less dangerous than the zip lines. An English couple living in Singapore were up for it as well. I went head first and did a spectacular side flop that even caused the locals to grimmace as they heard it. We went a few more times and tried out a zip line before we called it a day. We had made it about 100m down the river before it had gotten dark and we got a tuk tuk back into town. Claire was feeling the worse for wear so stayed in while I went out to meet some of the people we had met during the day. I came back, very drunk mumbling about someone who had stolen my sandals. In the morning Claire went outside and saw a pair of sandals which looked pretty much like mine. One looked wrong to me though. I started trying to work out how they had gotten there – perhaps someone followed me home or maybe i had mentioned where I was staying to someone who found them after I left. But my flip flops were missing. How could that have happened? The mystery was solved when I found my flip flops where I had left them in the bar the previous night. My sandals were my own (but still felt like someone else's). I had a bit of a limp from walking home in my bare feet but much more painfully I had some excellent bruising down my left side where I had crashed off the slide. All in a day's tubing. We found a place that showed the Simpsons and vegged out. We stayed another day or two, hanging around the guesthouse or watching crap TV in town. It was a bit like a time warp – we weren't sure exactly how long we had languished there when we eventually left.